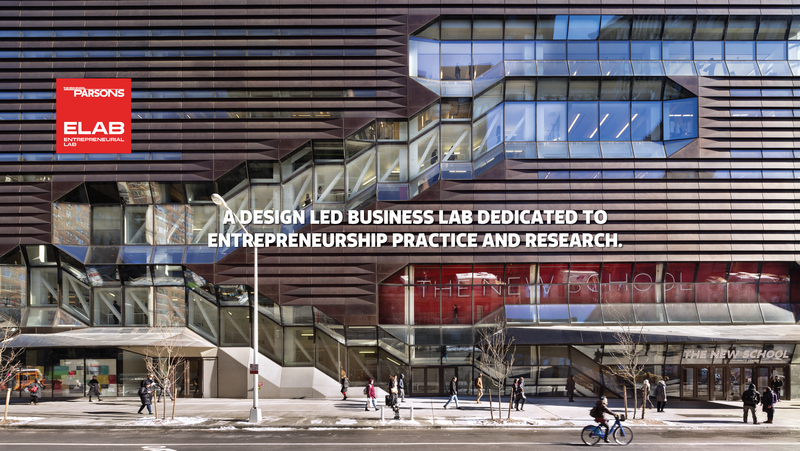 The Parsons ELab calls for mentors for its one-year-long Fellowship Incubator. This year’s cycle commences on January 2019 and runs through until October 2019. Apply to be a mentor here! If so, what was your division? Maximum size 30MB. The picture will be uploaded with your bio on our website's Mentors' page. Please write down a short bio of around 150 words. What is the Elab Fellowship? We believe that building the future economy is a collaborative effort and we aim to assist our students and recent alumni of all graduate spaces at The New School in their journey of (becoming entrepreneurs) creating new businesses through the lens of design and strategy. Through the Elab, second year students and recent alumni – upon graduation to 3 yrs out – who have proven scalable business ideas and entrepreneurial spirits will benefit from internal and external support for a year, including discounted coworking spaces, mentorship, professional business advice, strategic networking, informational workshops and panel discussions. The ELab Mentors are Parsons alumni with minimum of 10 years of professional market experience and business success. Many are entrepreneurs themselves, they want to give back to their community , volunteer to support students and Fellows on their journey to becoming entrepreneurs. Mentors will be matched with recent grads start-ups that align with their skills, expectations and goals. The mentorship program is designed to be a flexible opportunity for both parties to benefit and create a growing professional relationship and community for future success. It may take several formats depending on the mentors’ availabilities and actual mentees’ needs. The New School has helped mold many important changemakers in music, media, art, design and the social sciences over the years, and within this context, we are excited to build and support with you a shared exploration in entrepreneurship and the emerging new economies. We can continue this stewardship in a more networked, collective and collaborative way through digital and analogue methods. Obtain personal satisfaction by making a difference in the career development of the new generation, facilitate your own professional and personal growth by sharing the knowledge you learned through your years of experience, and give back to the industry and the institutions that helped you gain your expertise and reach success. Mentoring is an empowering and rejuvenating experience that impacts both mentors and mentees and largely contributes to their development. Through your obtained leadership and management skills and using effective communication techniques, you will be inspiring a new generation of leaders who are passionate about their fields of study and who want to make a difference in the world. Those recent grads are budding entrepreneurs who aspire to be highly successful and (look for)need our guidance to achieve success. In addition to sharing your wide network of professional connections in (your field) the industry, this experience allows you to tap into the emerging startup world and reach out to the talents of the new economies and gain fresh new perspectives. A mentor-mentee relationship offers benefits in addition to acquaintance, networking, and support. Trust and respect are important factors that deepen this relationship and takes you into an ever evolving new space of fruitfulness. Be one of the game changers by helping shape the future industry landscape and be one of the first insiders involved in impactful adventures and innovative projects that mold the future economy and impact lives and jobs in our communities. Mentors can be the change they want to see in the world through their efforts of instilling seeds of growth in the new generation. A mentor affects the professional life of a protege by fostering insight, identifying needed knowledge, and expanding growth opportunities. This is why we are looking for mentors who are alumni with 10+ years of experience in entrepreneurship, running their own businesses and professional services, with expertise in a variety of fields that may include and are not limited to the following. Whatever your skills are and your field of expertise is, we are wide open to emerging opportunities in this new era of constant change and knowledge flow. Feel free to add your own categories and customize your contribution to the program. This is our primary list of current and past mentorship spaces and needs. Each year the Fellowship Program will have approximately 12 mentors and friends in a timebank available to the current cohort either through office hours, mentor check-ins, panels or talks. The ELab team will work to keep the pool diversified and appropriate to the needs and sectors of the current cohort. Besides the current 12 mentors, we will also supply the recent alumni with a list of vetted professional alumni that their startups can reach out to for professional services and support. Soon, a matchmaking online platform will allow mentors to upload information that they would like to share about themselves, expectations and interests along with tags for their expertise so fellows can find and connect with them. Currently, the ELab has a list of potential flexible formats for this opportunity, displayed on this page with a 1-minute online application form. If interested, you may fill it out, upload a quick recent bio or resume with a link to your LinkedIn page. The list may be checked off with what best represents the way you would like to network and support the emerging Parsons startups.